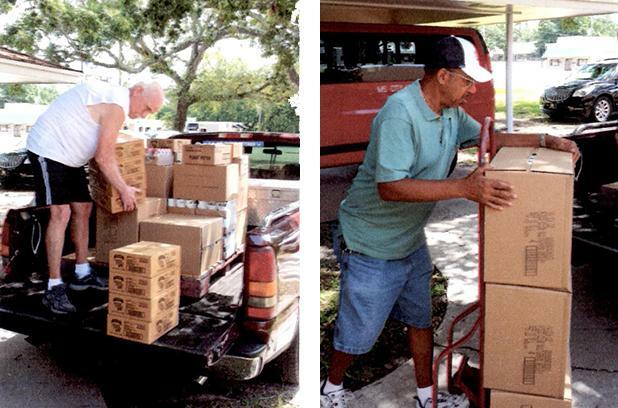 Photo right: Terry Wiggins, pictured left, and Archie Holland, pictured right, unload monthly provisions from 12 Baskets for the Prodigious Pantry. The members of Mississippi City United Methodist Church in Gulfport, Mississippi, have been extending the hands and feet of Christ to those within their community. Their food pantry ministry, the Prodigious Pantry, goes beyond those that they know to touch others within their community. In recent years, they have partnered with 12 Baskets, a Catholic Charities organization to receive food, but learned more help was still needed. They realized that the allotment given wasn't enough to cover their growing client base. The Prodigious Pantry serves an average of 82 families, which turns into close to 200 individuals a month. The Prodigious Pantry aims to look beyond the business district of Gulfport to spread their love and help to others in need. Throughout their time working in the pantry, some workers will develop a bond with those who stop by more often. The workers take this time to talk to them and pray with them if they ask for it. For those working, the participants with the Prodigious Pantry have become more like an extended church family. Working with 12 Baskets allowed The Prodigious Pantry to start their work, but their Mississippi Conference Connectional Ministries Mission Grant allowed them to expand it and touch more lives. The Prodigious Pantry has distributed food to 555 households between November 2014 and July 2015 as well as distributing 204 bags to the members of the homeless community in their area.